I know it should be all talk of pumpkins and perhaps tentatively mentioning the 'C' word (well it is two months today) but today I'm referring back to my recent travels and sharing with you some of the products that have accompanied me on my trips. It's been rather helpful that I could go from one trip to another (with a week or twos break that is) and know exactly what worked and didn't and could almost repack whilst unpacking. The first handy must have is Arm and Hammer Advanced White Toothpaste*. As a smoker, and one taking advantage of duty free prices a whitening toothpaste is something of a necessity and this does the trick perfectly. Hailing back to the old days and containing baking soda to tackle any staining from smoking and sangria it gives my teeth a fighting chance. Do I like the taste? No, I hate it but for the days I'm on holiday it does the trick and this small 25ml tube has been used by myself and my companions on no less than four trips before finding it's way into the empties pile. Yes there is the Gillette Snap made for travel and my favoured razor at home is the Gillette Venus & Olay but for ease I grab one or two of the Wilkinson Sword Beauty Razors which perform adequately for the days I am on holiday. I always throw a pack of these razors into my shopping trolley when wandering the aisles of Tesco as they are handy to have in a pinch. It's not the most 'caring' of razors and no way performs as smoothly as the Gillette Venus but nonetheless it is ideal for using and throwing away and I find I need no more than two during a week long trip. I appear to get the most attention from my travel sized tube of FemFresh Daily Intimate Wash* in the shower than any other and it's not jokes might I add it's my friends asking where I found this. I received this directly from a PR but assumed that these travel sizes were readily available but as googling and my friends comments tell me that is not the case. FemFresh, get on it we want travel sizes readily available. When I first posted about FemFresh it was admittedly tentatively but since then many friends have shared their stories about how they love this product and it's a shame on their travels they either have to pack the full size or forgo for the trip. This seems a shame when, depending on your activities whether it's getting all hot and sweaty on the dancefloor or the beach you might need to give 'down there' a little special attention. NatraSan First Aid Spray* joined me on my holidays and mum borrowed it for her week in Morocco so it's certainly collected the stamps in its passport. Mum even returned it to me saying her friend had commented on how good it was. There's nothing worse than all sorts of insects having a nibble whilst away and a quick spray from this helped aid any itching from bites so I could get to sleep at night. I always seem to have a selection of Soap & Glory travel sizes available for travelling thanks to often adding one of their gift sets to my Christmas lists or their three for two offers. Gone are my younger opinions that using an exfoliator would scrub away my tan and I recognise that exfoliating during my trip actually aids tanning. Soap & Glory Scrub of Your Life is a great, especially if you have managed to burn and are peeling a little - even the boys picked this out of the shower too. You can't go wrong with a Soap & Glory shower gel and Foam Call does the job. It doesn't set the world alight and I'm in no rush to replace it but this tubes can just about cover a seven night trip and you can often find them on three for two like now. A favourite duo I used on my trip was L'Oreal Elvive Colour Protect Shampoo and Conditioner. This duo was in my travel size bag and I grabbed for one of my trips as I'd said goodbye to my favourite Bumble and Bumble Thickening Shampoo. 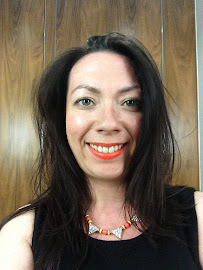 It wasn't a considered purchase at the time, I think perhaps grabbed from a supermarket when heading out for an impromptu sleepover but whilst using on holiday I really liked the results and am keen to repurchase in full size when the need arises. As my hair is now coloured, and bleached at that, it was my first time having to pay more attention with caring for my hair. L'Oreal Elvive Colour Protect Shampoo and Conditioner certainly did that and gave such great results I could simply wash and go without having to worry about heat styling which was perfect. I'm already a big fan of Colab Dry Shampoos and love their Extreme range and would usually purchase a travel size for my trips abroad but having picked up the newest release Colab Active Dry Shampoo with it's protection against sun damage and city pollution I gave away space in my luggage to the full sized can. Such was my love that space was found for all my trips bar Ibiza due to hand luggage restrictions - please can we have this in a mini size. Whilst I am now blonder my roots are still brown so the usual issue of worrying about white casts is a factor and again, this does not occur with Colab Active Dry Shampoo. Whilst I might not be the most 'active' on holiday things still get a little sweaty when sitting out in the sun so this is a perfect refresher. I often wonder if Bumble and Bumble Salt Spray actually does anything and it's not just become a product that I associate with Summer and my holidays. Of course I'm being flippant and it does do the trick. Out of the shower, a spray of this on my hair and leave it to air dry and I'm good to go with a little texture that takes me through the night. Finally Sure Compressed Deodorant*, a travel friendly 125ml size which will last as long as a regular 250ml. Sure has Motionsense technology to work with you and your body as you move so if you're planning some heavy nights out dancing this could be perfect for you. I don't find Sure Sprays work as well for as Sure Maximum Protection I must confess but they perform perfect adequately for me and my minimal activity that occurs during a holiday. What products will you not travel without? 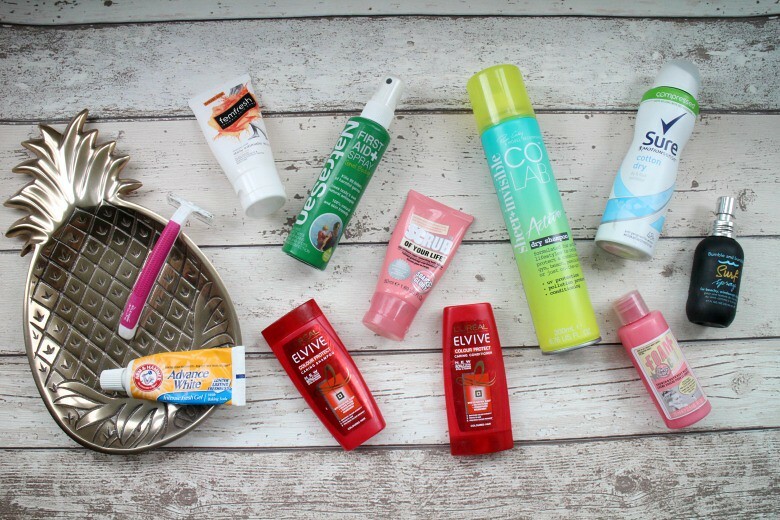 Fab post, I love the bumble and bumble surf spray! It doesn't give as much 'volume' as the other version but it definitely adds texture and has worked a treat whilst I was on holiday. It's a holy grail product that's for sure. Elvive Shampoo's do often smell great don't they! Life Update | I'm a Full Time Blogger!